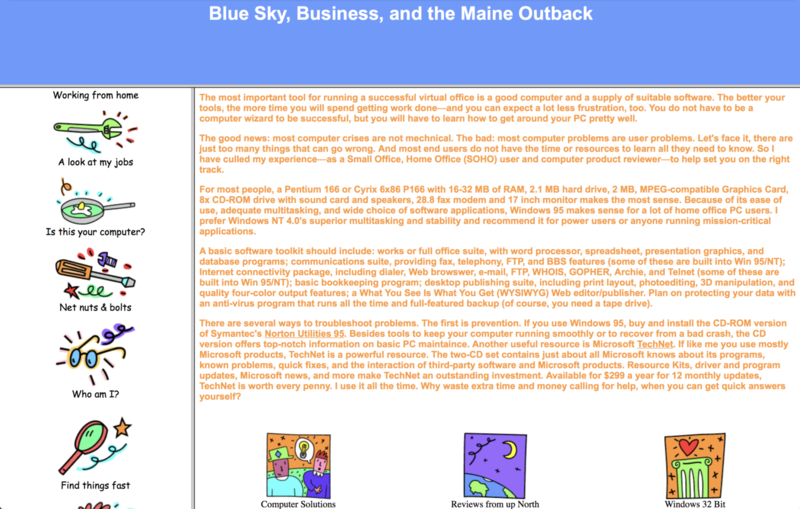 This afternoon, I looked over Archive.org’s Wayback Machine for the first time ever and was delighted to find cached copies (e.g. 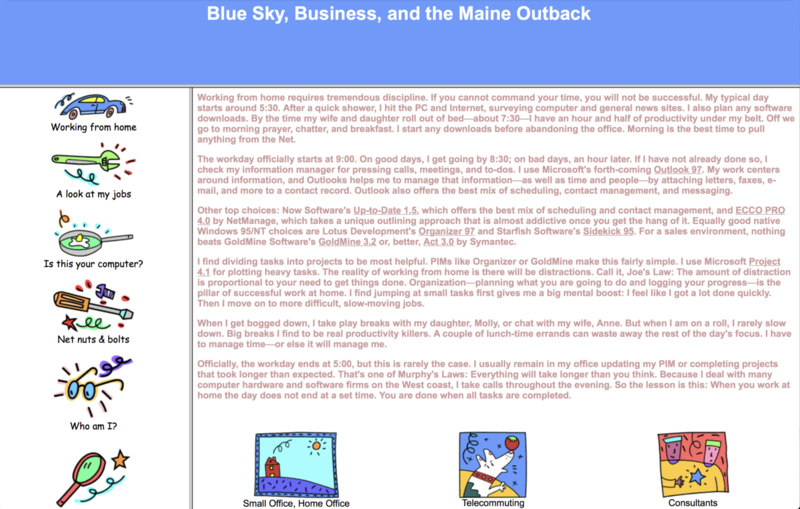 snapshots) of my first, personal website at editors.com, which I registered in August 1995. Foolishly, when needing some extra money, I accepted a $3K offer to sell my first domain in May 2004. I have lots more to say about that decision—in the future. For now, let’s look at the past. At the time of the site’s snapshot, Dec. 27, 1996, my family prepared to leave my hometown of Caribou, Maine—where we had been for about 18 months—and return to the Washington, D.C. area. There I would take the editor’s position at Government Computer News responsible for the newly created State and Local section. I launched the site at least a year earlier, hand-coding HTML tags. During most of my Maine stay, I spent the majority of my paying work hours building websites for other small businesses or writing about technology products and using them effectively. 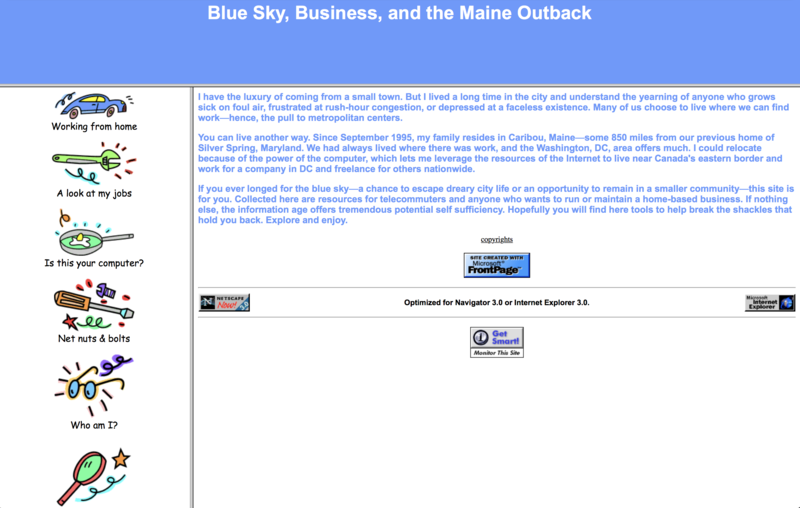 Perhaps that explains title “Blue Sky, Business, and the Maine Outback”, which I don’t recall. By the end of 1996, I mixed hand-coding with FrontPage, a pioneering WYSIWYG (what you see is what you get) visual editor that Microsoft purchased from Vermeer Technologies about 11 months earlier. I intentionally offered telecommuting and technology advice, based on personal experience, with the hopes of assisting small business owners and people working from home—a burgeoning but contained business lifestyle 21 years ago. Personal computers and the Internet were enablers, but they were often misunderstood in practice. I wanted to help, and informational resources were fairly scant in 1996. On the page above, when discussing the Internet’s benefits, I briefly mention my first Internet purchase, an office chair, ordered on a Sunday and received in the far reaches of Northern Maine on Tuesday. Free shipping! For 2-day delivery. In 1996! Kind of makes Amazon Prime seem lots less e-commerce innovating, eh? 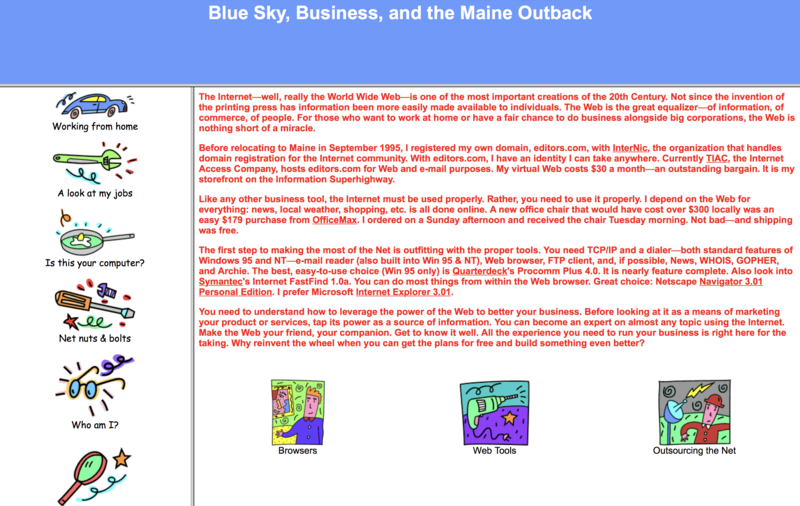 Content types taken for granted today were fairly foreign during the early days of personal websites—like the About page. And what nutcase puts up an About page for the place where he lives? But Aroostook—”The County”—is unique even for independent Maine. I believed that the area could add mystique to my home-based self-proprietorship and positive perceptions about small business consulting. 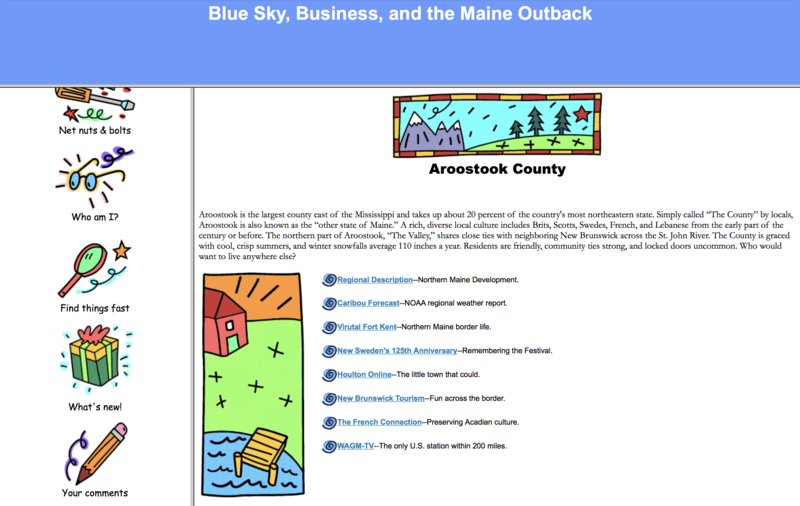 FYI: I registered Aroostook.org in October 1996 and still possess the domain, which is not hosted. That may change, though. 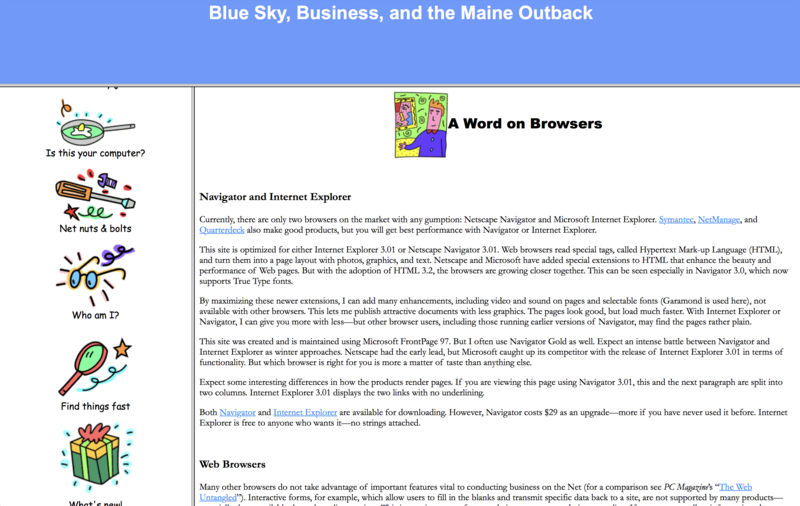 The main browser of the day, Netscape Navigator, and up-and-comer Microsoft Internet Explorer, mostly supported static content—and for good reasons. Dial-up connections were slow and couldn’t handle files of any meaningful size. It was the Wild Wild Web. 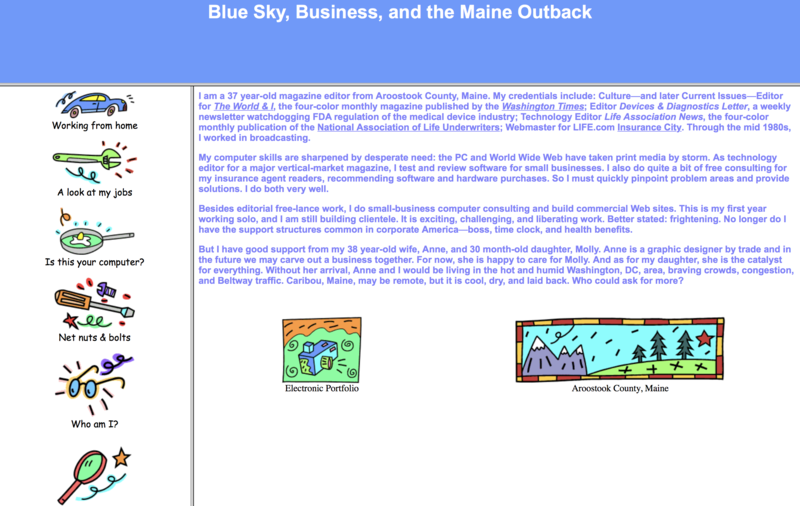 As simple seems “The Maine Outback”, the design was fairly colorful and lively for the day. I purchased several sets of graphics, $99 each, from Image Club, which was acquired by Aldus, which Adobe absorbed. Hehe. The graphics files shipped on 3.5 disks; I long ago copied the contents to hard drive. Lest I am mistaken, the art is no longer legally sold. My first website is long gone, but its art remains. But not all is lost. 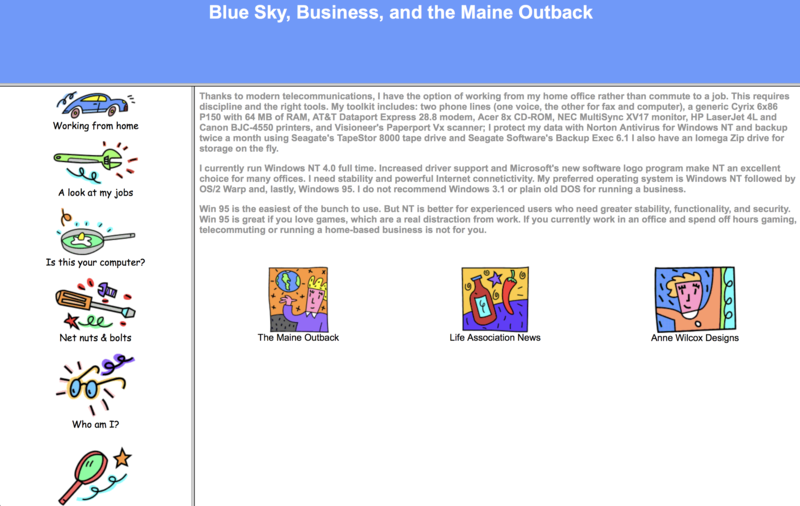 I will use the Wayback Machine to recover and repost with original date some of the content from “The Maine Outback” and also early versions of joewilcox.com. Stay tuned!